Friends, our house is whole again...well, almost. The floors are done, the painting is (mostly) done and all our belonging are back inside. I'm still putting it all back together again, piece by piece, and as much as I want to be able to snap my fingers and have everything in its place, there is something really essential (and pretty zen) about taking some time with each of our possessions. I've been dusting and arranging and assessing. A few things found new homes, a few things were discarded and a few things loved anew. It's been a really fulfilling and satisfying (if not totally exhausting) process. I had to share a few shots of the rooms that are back in one piece (above). In that second photo, you can get a glimpse of our new, lighter maple floors and the travertine tile. We also used the fact that we were already topsy turvy as an excuse to change-up swap some paint colors in a few rooms. The net effect is the same...only better. During our breaks from "operation move-in", we swam a lot...and ate popsicles and hula hooped and had dinner with some buddies on the patio at La Duni while the kiddos ran nuts in the park out front. Pretty much your typical (highly excellent) summer activities. Oh we also cheered the Mavs on to their first NBA championship last night. It was v. exciting, I have to say. Hope you guys enjoyed all sorts of summery fun this weekend! congrats on getting back into your (beautiful) home! 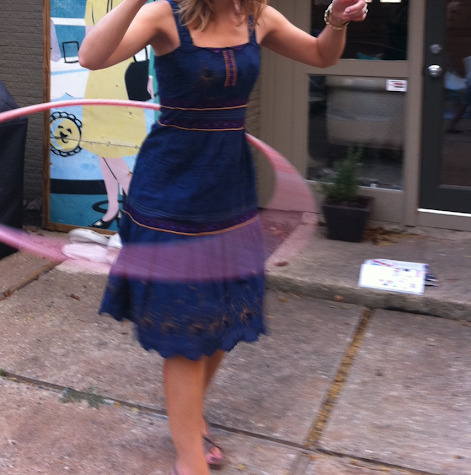 I love me some hula hooping! Inspired to get my groove on with my hoop. Sounds like a lovely weekend all around! And the house is looking fabulous! First, wanted to say congrats on 'moving back in' -- your house looks amazing. i love the little snippets you've shared and hope you'll share more! Second, can you tell me what kind of plant that is in the top photo, right corner? I'm looking to add a little greenery indoors, but I'm not sure what to get... we have a lot of windows, but not bright sun, so I'd need a (kid-and-pet-friendly) plant that can be in indirect light. Any suggestions? Your home looks fantastic as usual. I love the photo wall. Everything looks gorg Joslyn. You really know how to put a room together. The pool looks perfect. Can't wait to see more! It's looking beautiful joslyn! You make the most beautiful vignettes. They seem to tell a story.